A member of the brassica rapa family, wasabina has a slightly hot flavor that is reminiscent of wasabi. 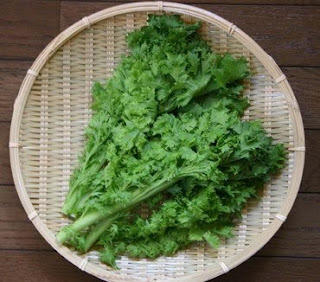 It is high in vitamin C.
Wasabina is a versatile green that can be used raw or in soups or stir-fries. The light spiciness of wasabina goes well in a spring or early summer barbecue with to complement a grilled meat dish. Echigo Farm is a small, family-run farm specializing in healthy fermented foods, naturally grown Japanese produce, and traditional Japanese baked goods. Located 25 miles east of Springfield, MO, Echigo Farm is a year-round operation utilizing 2 high tunnels, 2 acres of permanent no-till beds, and a state inspected kitchen where we do our fermenting. We sell produce at Farmers Market of the Ozarks, Mama Jean's Natural Market, and Homegrown Food, all in Springfield. We also offer a CSA program and online sales.